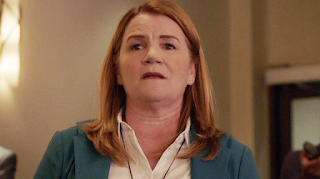 Mare Winningham as Sally in AHS: Cult's "Mid-Western Assassin"
I'm back to review AHS: Cult after a week off. Last week's episode certainly was an exciting one, filling with a lot of reveals. However, there was a severe lack of explanations with those reveals, leading to a lot of curiosity for this week's episode. I'll be formatting my review a bit differently this time. Instead of my usual recap, I'll be providing a longer analysis of the episode. That doesn't mean there aren't spoilers though. As always, there will be PLENTY of spoilers in this review. This episode sees the long-awaited return of the lovely Mare Winningham, and AHS favorite who was dearly missed in last year's Roanoke. Unfortunately, we don't get her back for long. Her Sally is offed almost immediately by the Insane Clown Posse (no, not that one). It's a real shame too, because Like Emma Roberts's Serena, Sally had a lot of potential. She could have been a powerful force to help Ally take down Kai, but alas. If it were nearly any other actress, I wouldn't mind, but Winningham made a character that we barely knew super likable, so it was a true shame to see her gone so soon. I was so excited for her to be back and this was really a disappointment, despite her being given a solid character. She will be missed, but maybe she'll return next year? One can only hope. Much of this episode focuses on the wonderful Meadow Wilton, who quickly turned into one of my favorite characters this season after not making a great first impression. At first, I underestimated her potential, thinking this neighbor from hell would end up doing very little in the season. But boy was I wrong. She shined very bright in this episode, with the episode beginning with a mass shooting that would be revealed to have been caused by her. She also revealed all there is to know about the Cult to Ally, who responded by going to Sally and we know how that all ended. When she returned to Dr. In-On-It Vincent's, Meadow had vanished and by the time we saw Meadow next. It happened. This episode did prove to be the end of Meadow. In a scene that had me screaming "Nooo!!!" at my TV, Meadow kills herself after committing mass murder, all at Kai's demand. The fact that I felt saddened that a character that is so morally-challenged had died really is a testament to just how great Grossman was in this role. At least at this point in the series, Grossman is easily the MVP. We didn't get too much Ivy screen time this episode (thank heavens), but what we did see of her was very revealing. We learned that she joined the titular cult because she basically just hates her wife and she wants to ruin her life so she can get full custody of their son (AKA: Ivy is a horrible person). She hated how she "rubbed it in" that Ally carried Oz and not her, but the last straw was Ally voting for Jill Stein. Which is ridiculous. I totally understand that AHS is trying to go political this season, but this is just beyond stupid. Turning on your wife because of the way she voted? Yikes. This again supports the fact that Ivy is the literal worst. However, she does something that isn't completely terrible this week, not turning Ally in to the Cult when she finds her in Sally's bathroom. Oh, how sweet! She didn't turn her wife in to be murdered by a cult of psycho clowns. One thing with Ivy that I theorize is something major is that unlike the other Cult members, she's dressed as an elephant instead of a clown. Could this be a hint that maybe she doesn't completely fit in with the cult? Hopefully, because she's pretty unbearable at this point. At the very least, let her do something worth sucking up screen time from more interesting characters. All in all, this was a solid AHS: Cult episode. It provided some explanations to questions we've all probably had for a little while, like "Why would Ivy join this cult?" Unfortunately, it couldn't answer the question of why Ivy is so darn unlikable. But maybe next week. Leslie Grossman gave a top-notch performance this week, and I'm going to miss her so much in the coming weeks. But on the plus side, Frances Conroy, the genius that brought us the show's best character, Myrtle Snow, will return next week after a few seasons off from being a major force in the show. Hopefully, unlike Winningham and Roberts, she can stick around for awhile. What did you guys think of the episode? Let me know in the comments below!